As a woman, I should have my pick of jewelry, whether expensive or budget friendly. However, I do not have much jewelry at all. At present, I own two necklaces, one ring and one pair of earrings. I guess you can tell I'm not a socialite eh? 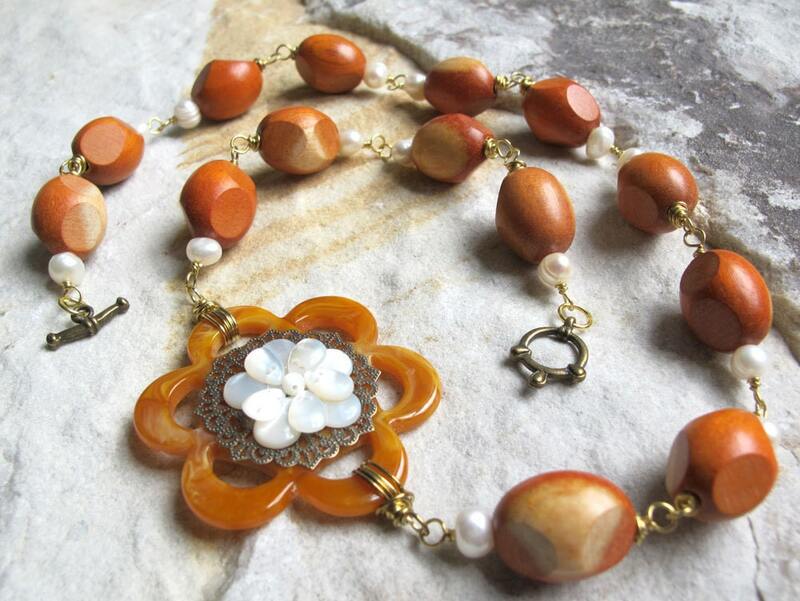 I'm adding to my meager collection with a lovely necklace from NearTheWillows. 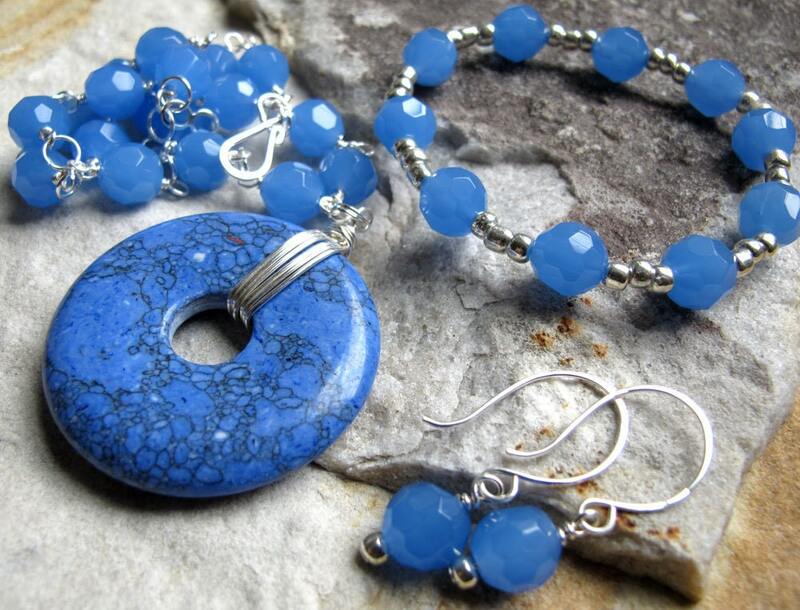 The Blue Sodalite Necklace is really beautiful. My daughter also love this necklace and it fits her nicely. I think I'll share with her. Katie has some gorgeous jewelry at her etsy shop. You have to visit NearTheWillows and see how beautifully creative she is! I absolutely love her designs! This necklace is breathtaking. 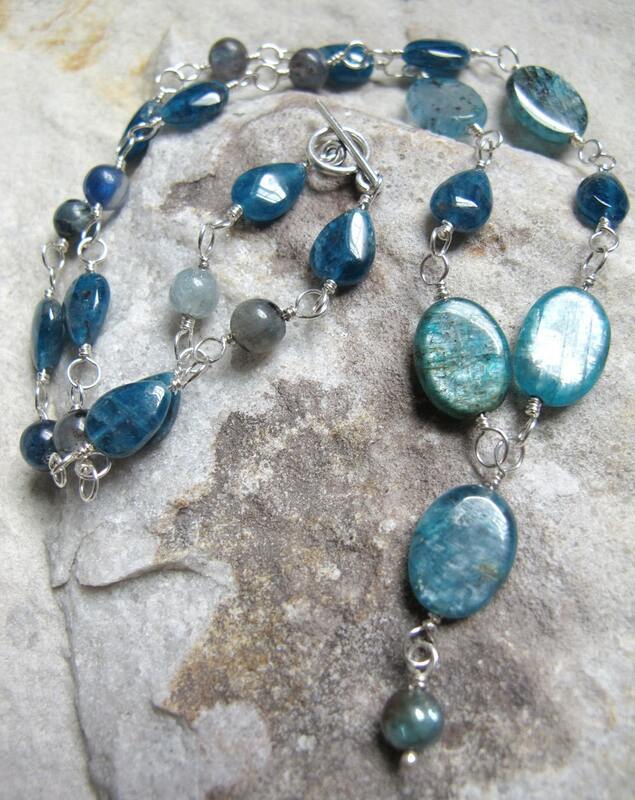 The blues of the Apatite and Kyanite are beautiful and natural, these stones are not dyed. Each stone is wire wrapped in sterling silver, and directly linked to the next bead ensuring durability while wearing. A sterling silver toggle clasp finishes off the necklace which measures 18 1/2 inches. The matching earrings come with the necklace. They are made with sterling silver wire wrapped apatite on a sterling ear wire. 1 1/4 inches. 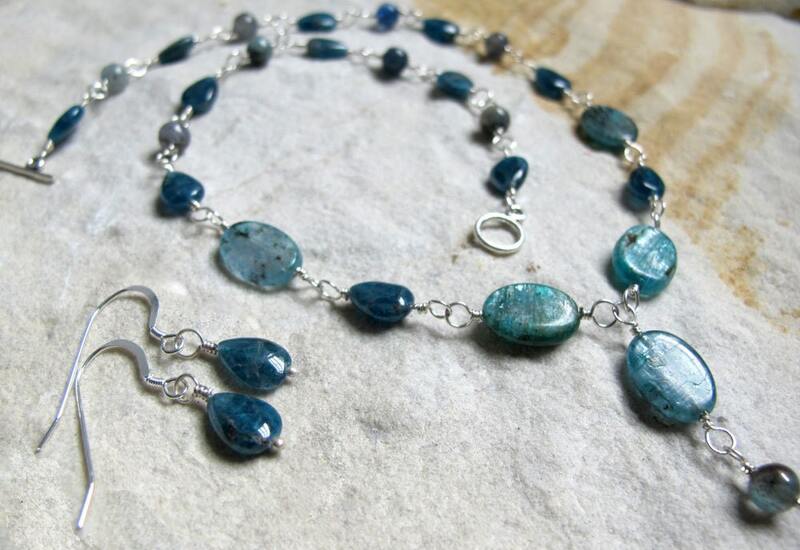 Apatite is said to enhance intellect, focus, learning, concentration and ideas. It promotes unconditional love. Kyanite is a calming stone. It helps to quiet the mind and let go of anxiety. This item comes in a gift box, ready to go! Look at some of her other unique, colorful and delightful pieces! 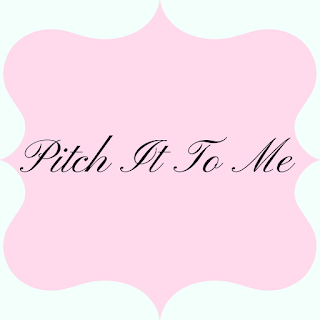 My name is Katie, I am a military wife, with a few transfers under my belt. This is why I wanted to be able to work from home - and have a job I could "take with me" whenever we moved. I am a graphic and web designer as well as jewelry designer. We have a son who came into our lives almost 2 years ago at the age of 2 weeks old. He makes every day that I get to stay at home with him worth it - no matter how late I have to stay up at night in return! Another great thing about Katie's designs are that, proceeds from some of her pieces are donated to the Myelin Project. You can WIN the Blue Sodalite necklace to compliment or jazz up you wardrobe. 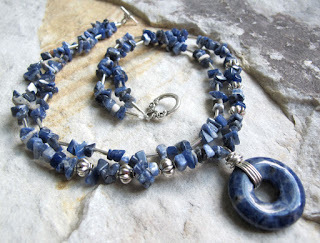 I received the Blue Sodalite Necklace as part of this review. See my disclosure. 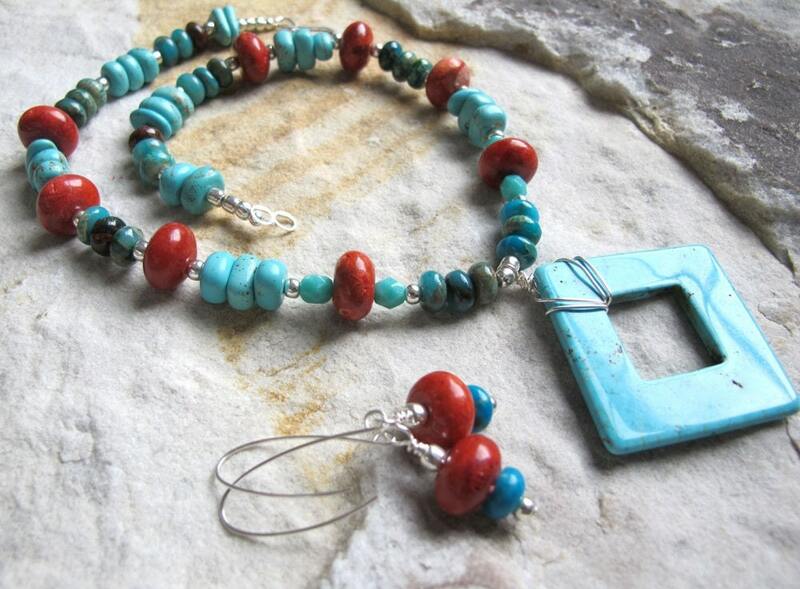 I think I love the Seahorse's Garden Coral and Turquoise Magnesite Set the most. It's very pretty! I like the Olive Grove - Freshwater Pearl and Shell Necklace. I love not a cloud in the sky...so many pretty ones...I favorited quite a few. I too love the olive grove freshwater pearl and shell necklace. Very pretty! I like the Lady Slippers in Grey - Pearl Necklace. The Steel Blue pearl and shell bracelet (http://www.etsy.com/listing/80369404/steel-blue-pearl-and-shell-multi-strand) is gorgeous! I love the A Good Book set. I love the Hyacinth - Purple Agate Necklace and Earrings Set. is my favorite , it's beautiful! Thank you for a nice contest! Love all of the jewelry, but if I had to choose, I would choose the simple brown leather wrap. First, I want to thank you for all of your excellent giveaways and fine blog. Among my most favorite favorites are the Smoke on the Water Necklace, the Mint Julep Necklace, the reserved "Red Sea Necklace" and your favorite "Something Blue Necklace"
I love the blonde bombshell necklace! I love the The Tea Room - Russian Amazonite and Sterling Silver Earrings! Thanks! Mabel's Labels - Labels For The Stuff Kids Lose! Fly High with "Tora! Tora! Tora!" Do You Leave Your Garage Door Open? Reading The Newspaper - Aloha! Six Wings and Covered with Eyes All Around! The Little HOT Dress or The Little Black Dress! 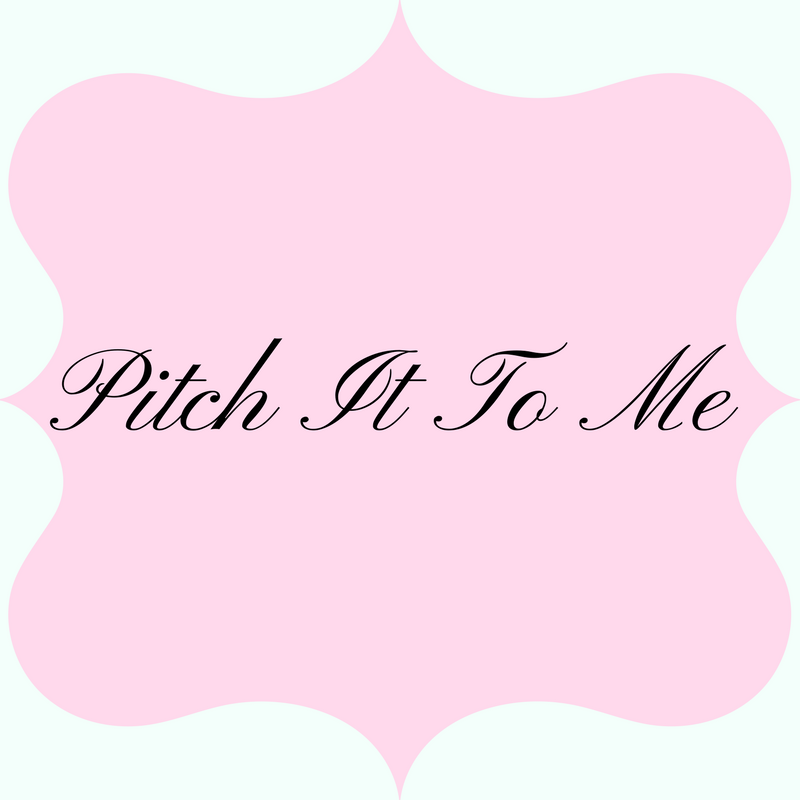 Blogorama Bonanza Giveaway Bash 2011! On The School Bus Yea! Pillsbury Doughboy Breakfast Boogie - NEW!